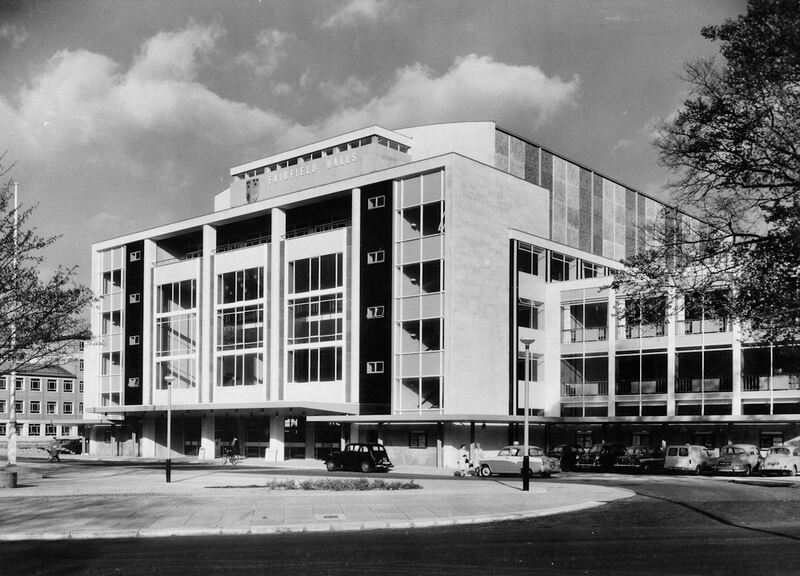 The Fairfield Halls was opened in November 1962, and was an entertainment venue built to support the demand of an ever growing Croydon population. The name comes from the previous use of the site as a ‘Fair Field’. The venue comprises of three ‘halls’ known individually as The Concert Hall, the Ashcroft Theatre and The Arnhem Gallery. 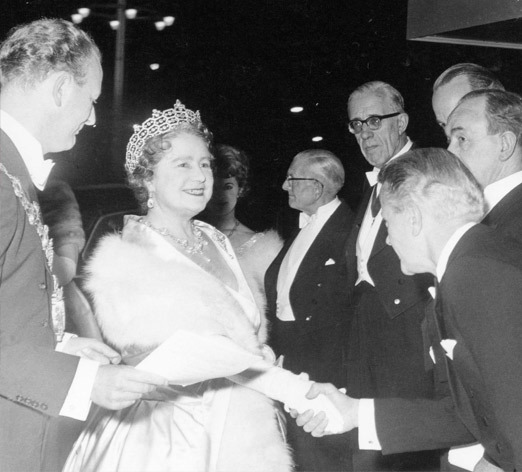 Her Majesty, Queen Elizabeth, The Queen Mother opened the Fairfield Halls on Friday 2nd November 1962. The inaugural concert was performed by the BBC Symphony Orchestra, conducted by Sir Malcom Sargent, with renowned soloist Yehudi Menuhin also performing. The opening events were covered extensively in the local press. The Concert Hall seated 1794 people and its acoustic quality was internationally recognised, especially for classical music. Even the holes in the seat bottoms were designed to give the same acoustic reflection whether occupied or not by audience members. The concert platform had fifteen hydraulic lifts that raised or lowered different sections, which meant that it was very flexible for performers. 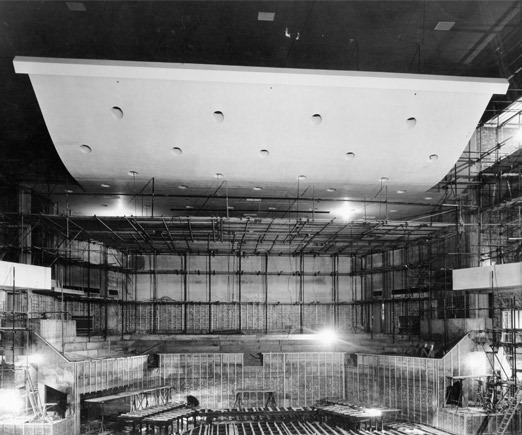 The Concert Hall had a raked auditorium with fixed seating and only the first two rows ‘on the flat’ could be removed easily. Many live recordings took place in the Concert Hall, including ‘Friday Night is Music Night’ and has been performed in by internationally renowned orchestras and musicians. The Concert Hall was also home to an organ built by Harrison and Harrison of Durham, designed by Ralph Downes, who was also responsible for the design of the Royal Festival Hall organ. Many organ recitals have taken place in the Concert Hall and Ralph Downes played for the inaugural organ concert in 1964. The Concert Hall has seen a wide variety of performers over its 50 year history. 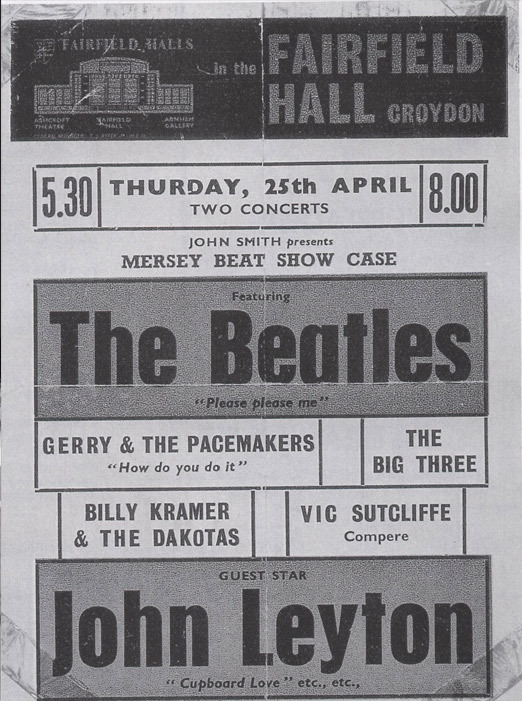 This has included, The Beatles, who played twice in 1963, Elton John, David Bowie, Morecambe and Wise as well as a number of internationally acclaimed orchestras and musicians. 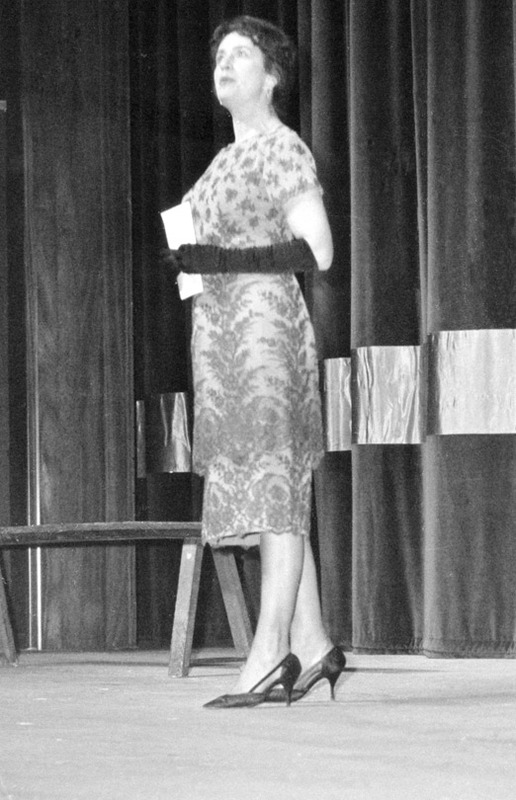 The Ashcroft Theatre seated 763 at full capacity and was opened on November 5th 1962 by Croydon-born actress Dame Peggy Ashcroft, after whom the theatre was named. The opening ceremony included the reading of a monologue specially penned by Sir John Betjemen called ‘Local Girl Makes Good’. The first play was ‘Royal Gambit’ starring Dulcie Grey. Again there’s a long list of names that have trodden the boards at The Ashcroft Theatre and these include Richard Todd, Martin Jarvis, Rex Harrison and Dame Peggy herself. Safety Curtains go way back to the days of gas lighting and were meant to stop a fire onstage or backstage spreading to the auditorium. 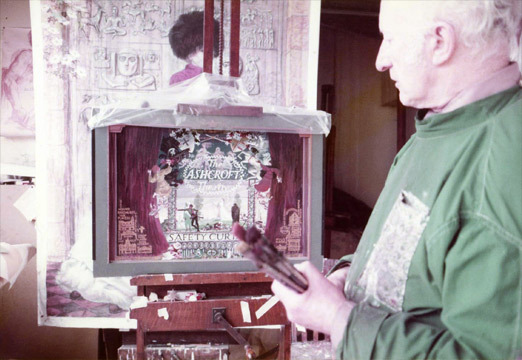 The Ashcroft Theatre Safety Curtain was painted in 1982 by a Northampton based artist called Henry Bird. Henry was famous for his murals and painted another Safety Curtain in his hometown of Northampton. In 1997 some restoration work was carried out by Henry’s daughter-in-law Lis Bird. The curtain included a lot of detail, symbols and references to the days of the Croydon Fair, the travelling players, famous artistic Croydonians and old English customs. The Arnhem Gallery was originally conceived as an art gallery, as well as a banqueting room. It was named after Croydon’s twin-town of Arnhem in Holland. In the Arnhem foyer was a tribute to the WWII battle fought there and subsequently immortalised in the film ‘A Bridge Too Far’. Indeed the first art exhibition, seen by over 5000 in the first week, was an exhibition of artists from Arnhem and Croydon and was opened by the Arnhem Burgomeister. 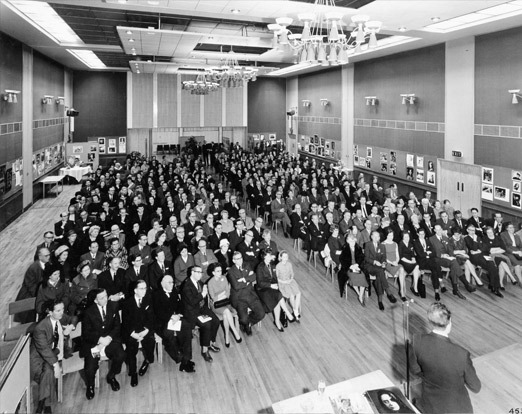 As well as showcasing art exhibitions, the Arnhem Gallery hosted many events, including boxing matches, cabarets, parties, pageants and wedding receptions. 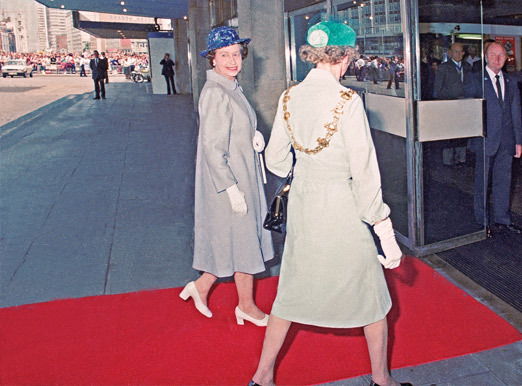 Queen Elizabeth II herself sat down to lunch in the Arnhem Gallery on June 21 1983 for the Borough’s charter centenary.